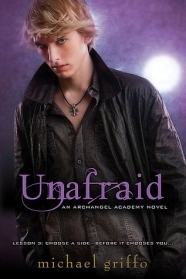 The boarding school known as Archangel Academy possesses a legacy of secrets known only to a privileged few. For in this peaceful, charming part of England lives a population of vampires at war with one another–and Michael Howard is caught in the middle of it all. . . But there are enemies too, some of them hiding in plain sight. Being strong enough to defend himself isn’t enough. Michael must find a way to protect his entire race of vampires. Dark forces within the school will drive everyone to take sides in the escalating violence. And for all his new powers, Michael will discover that love, jealousy, and vengeance have a danger all their own. . . It took me over two months to make it through this one. I just found it a struggle to maintain an interest in the story. While I found myself originally drawn into the series and its British academy teeming with sixteen year old vampires, as it progressed, the overall story arc surrounding one seriously pissed off principal failed to enrapture me. In terms of Michael and Ronan’s relationship, I found that book three really didn’t take them any further. The mountain of angst they were put through in the previous instalment is practically non-existent now. Some may like that—they have past their tests and it’s them against the bad guys rather than mistrusting each other. I like a bit of both though. If things don’t get shaken up just a little, they can feel stagnated. A growing gripe of mine throughout the series has been the constant point of view shifting, sometimes even within the same paragraph. It not only made it confusing, it restricted the ability to connect with the main character as well as I would have liked with all of the mental detours being thrown at us. I get the idea behind it, wanting to show us what’s going on in the background, but sometimes a little mystery—or a lot—can be a good thing. I really had no desire to know just what the theology teacher or the chauffeur happened to be thinking. It added little to the overall progression—or my enjoyment—of the story. The plot was pretty much a continuation of what we’d seen previously—David ‘the principal’ trying to find a way to destroy the water vamps because his species of vampires ‘the regular ones’ were superior. In getting there—to the end, that is—I don’t think it needed to be as long as it was. With a shorter, more concise plot, I might not have felt like it dragged the way it did. There was a lot of time spent on side characters, building up Ronan’s little sister as well as the new girl that one of our main couple’s friends had taken a shine to. This wasn’t so much the problem, but I would have liked if it had shown to be a more substantial part of the overall plot, therefore giving the time spent on it more meaning rather than just to fill the pages. After so much build up, I was left disappointed by the ease at which the main plot of the series was resolved. There was no ‘oh crap’ moment where the shock hits you, but that was probably due in part to the open-book style narration. I’m one who loves it when twists manage to knock you back and stare in awe at the author’s sly genius. Without that, I really didn’t feel satisfied coming to the end of this series. It does give you closure, if that’s what you’re after though. I liked the final few pages for that, but unfortunately that wasn’t enough to garner it a higher rating. Those who’ve already started the series and like to know how things turn out—like me. Sad to hear they didn’t improve! I really enjoyed the first book, but DNFed the second. I’ve been debating trying to read it again but haven’t made the time. Mostly for the reasons you’ve listed here. Boo!